The depth of training on hazardous noise and hearing protection is frequently too basic. You don’t have to go far in any city or along an interstate highway to hear the sounds of new construction— office buildings, hotels, restaurants, shopping centers, and houses. And just as you can hear the loud sounds of cranes, pile drivers, nail guns, and jackhammers, so, too, can the workers who are raising these structures. In fact, it’s a lot louder for them. Are they wearing hearing protection? In many cases, the answer is no. Walk past any construction site and you’re likely to see signs advising those who enter to don hard hats, protective footwear, and safety eyewear. You probably won’t be advised to wear hearing protectors. 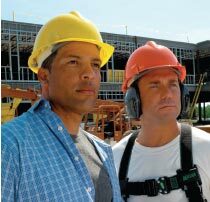 The simple fact is that, because noise-induced hearing loss (NIHL) shows no visible effects or trauma and accumulates over time, it’s low on the construction personal protection equipment totem pole. It’s also not heavily regulated in construction—and thus not enforced—like it is in general industry, mining, or railroads. OSHA does have regulations relating to hearing conservation in construction under its omnibus “Safety and Health Regulations for Construction” standard (29 CFR 1926). However, this effort to protect workers from hazardous noise is less than efficient. It identifies hazardous noise levels (CFR 1926.52) and states that hearing protectors “shall be provided and used” (CFR 1926.101). But there is no mention of dosimetry, audiometry, training, or recordkeeping; just an acknowledgement that “noise happens” and that you might want to do something about it. Admittedly, a construction site is a difficult environment in which to regulate or enforce good hearing conservation practices. Consider what it takes to erect a building—excavation, steel work, masonry, carpentry, pipefitting, electrical, HVAC, painting, welding, and roofing. These activities are performed by a wide variety of skilled and unskilled workers who work for large, medium, and small contractors and subcontractors, and they are on the job for anywhere from a few days to a few months (or even years) performing a wide range of tasks during their shifts. The transient nature of such an environment, where tasks and personnel are constantly changing, means that operations are noisy one day but may not be the next. Yet the problem is nonetheless serious. More than 500,000 U.S. construction workers are exposed to hazardous noise on a regular basis.1 However, the use of hearing protection has become the exception rather than the rule. In a study of construction workers in Washington state2 by Neitzel and Noah Seixas, Ph.D., CIH, results showed that construction workers were exposed to 85 dBA or higher in about 70 percent of their workshifts yet wore their hearing protectors less than 20 percent of the time. On the up side, the study also concluded that, on average, workers achieved more than half of an ear plug’s published Noise Reduction Rating (NRR) and that, most times, this was just enough protection for their application. Most construction noise was 95 dB or less. While there is an array of activities happening on a site at any given time, most construction noise averages less than 100 dB, ranging between 85 and 95 dB. While this does not lessen the need for hearing protective devices (HPDs), it does support the need for lower-attenuating and uniform-attenuating hearing protectors, which can help workers avoid overprotection and thus improve overall worker safety. In 2002, OSHA announced that it was considering a rulemaking change that would add an actionable hearing conservation regulation and enforcement for construction, much like general industry. The American National Standards Institute (ANSI) recently issued the A10.46-2007 “Hearing Loss Prevention for Construction and Demolition Workers” standard4 that outlined specific requirements for implementing a hearing conservation program in construction— accommodating a well-rounded practice of noise controls, audiometry, HPD use, and training. In fact, the standard presents alternative methods in managing audiometric records for a transient workforce. “What is unique about the standard is that it offers contractors flexibility in determining hazardous situations, and the contractor is not limited to costly TWA monitoring to make the determination,” Walter A. Jones, associate director of the Laborers' Health and Safety Fund of North America, said. “Because noise levels of common construction equipment are well characterized, the standard allows employers to use past monitoring, reference data, studies, manufacturer information, the standard’s appendix, or the old standard of workers having to yell to communicate to someone three feet away as a means of determining hazardous exposure or situations. Many states are reviewing the ANSI standard for their own implementation. And in the past year since the standard was announced, a few contractors are already implementing basic elements of the standard, increasing the availability of HPDs throughout work sites and the depth of hearing conservation training. 2. Seixas, Noah and Neitzel, Rick. “Noise Exposure and Hearing Protection Use Among Construction Workers in Washington State,” September 2004. This article originally appeared in the March 2008 issue of Occupational Health & Safety.